No matter how well you’ve crafted your lessons or how top-notch your adopted curriculum might be, you must still engage your students if they are to adequately assimilate your lesson content. 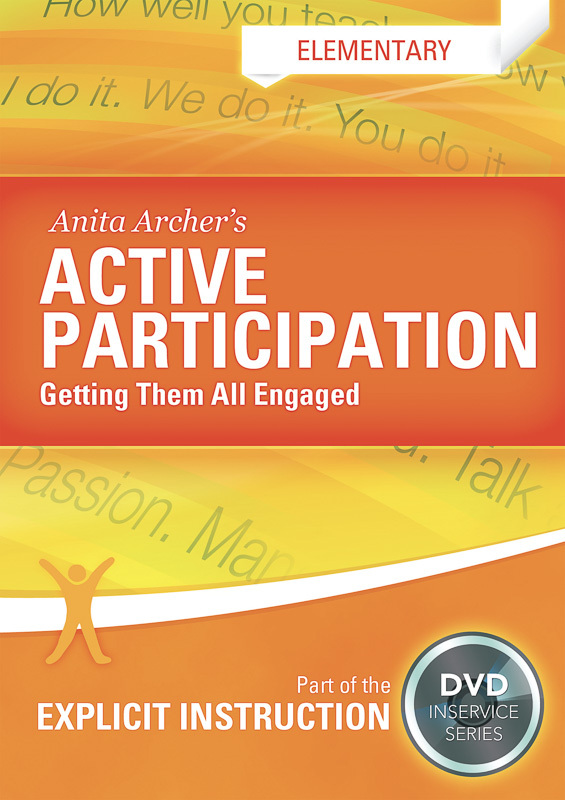 With Dr. Anita Archer’s Active Participation DVDs for the secondary level, you will learn how to engage all students in your classroom, from star performers to struggling students. 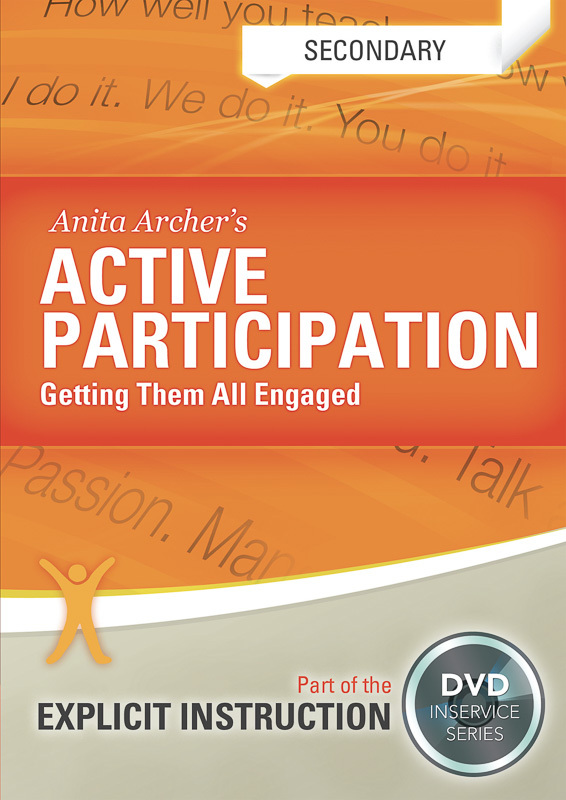 Active Participation DVDs can be used both to introduce teaching staff to active engagement strategies and to serve periodically as a systematic review of engagement strategies for staff who are familiar with the concepts, but need a quick refresher. Show the DVD on a large screen for whole-staff inservice or on a single computer for individual or small-group study sessions. Dr. Archer’s presentations are equally as effective! Please note that this DVD set is for secondary grades 6-12. There is another version that is tailored to elementary-level classrooms. Anita L. Archer, Ph.D., is an educational consultant to school districts on explicit instruction, the design and delivery of instruction, behavior management, and literacy instruction. 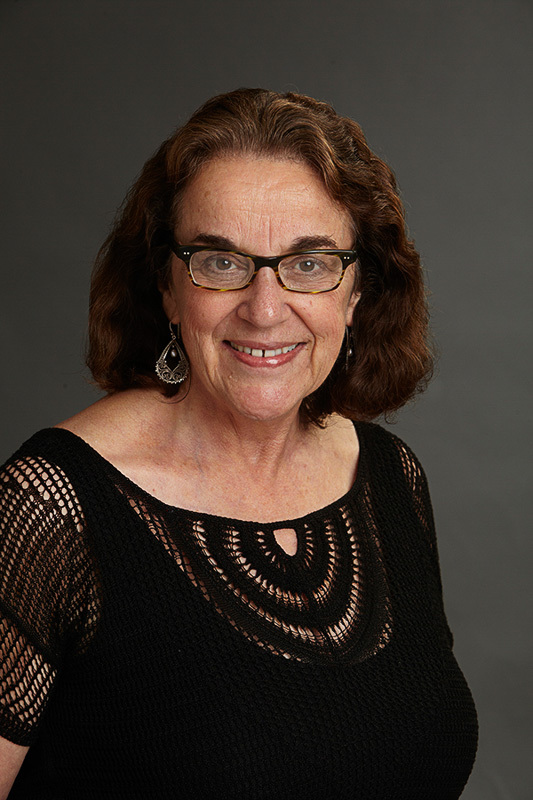 Over the course of her 40-year career, Dr. Archer has taught elementary and middle school students and has served on the faculties of San Diego State University, the University of Washington, and the University of Oregon. She is nationally recognized for her professional development activities, having presented workshops and seminars in every state. Dr. Archer is coauthor, with Dr. Mary Gleason, of numerous curriculum materials addressing reading, writing, and study skills. She is the recipient of ten awards honoring her excellence in teaching and her contributions to the field of education.